I’ve got another awesome success story coming up later this morning, but first…coffee. I’m not a breakfast eater as many of you know. As a result, my morning coffee is important to me. It’s a sensory experience I enjoy as well as a ritual that kicks off my day. Sure, the caffeine offers a little pick-me-up, but I make it count nutritionally with a collagen boost, too. I love Caveman Coffee, and it’s my favorite brand of beans to start with. After grinding those fresh (one of the great sensory pleasures of human existence), I pour them into my French press—the only way I make coffee. Once I add the hot water, I’ll let that sit for a couple minutes. In the meantime, I put one scoop of Vanilla Collagen Fuel in my cup and add just a bit of my prepared coffee—not quite a 1/4 cup. I’ll stir it up (the best way to blend everything in my experience), then pour in the rest of my coffee and enjoy! 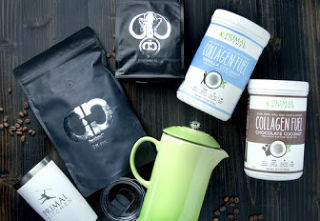 Here’s what it all looks like, plus a little commentary on coffee and collagen for a morning fasting routine. But, wait! Get a *bonus entry* while you’re at it by following us @marksdailyapple and @cavemancoffeeco on Instagram. Follow both and comment on the Mark’s Daily Apple giveaway post to tell us you’ve entered. Closes April 8th, 2019, midnight PDT. Open to those in the U.S. only on this one. Must be 18-years-old+ to enter. I’ll choose one random winner from those who enter before the deadline. The winner will be contacted on 4/9/19 and will also be announced on social media. Good luck, everybody. And in the meantime, let me know how YOU take your coffee. (I’m always up for new ideas.) Have a great week. The post How I Take My Coffee (+ Ultimate Coffee Giveaway) appeared first on Mark's Daily Apple.